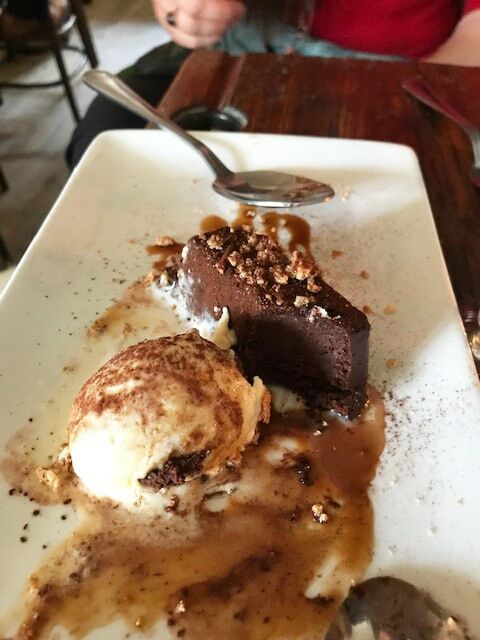 I don’t tend to celebrate Valentine’s day on the the day – partly because I am working but mostly because I tend to find the restaurants crowded and the food disappointing. So we celebrated Valentine’s today – Sunday the 10th. When we set out we had no fixed plan (though the vineyards of Nyetimber just outside Pulborough in Sussex was mentioned (they do excellent wines) – but a quick call failed to reveal if they have a restaurant. We left ourselves to fate….and as so often happens fate came up trumps! The Horse Guards Inn has some of the best food I have tasted, delivered by attentive and skilled staff. The owner/manager Sam is an absolute joy of charm and customer service and it comes as no surprise that the place was packed. Dog friendly too. When we arrived there were no tables to be had! Disaster…we requisitioned a side table not officially in use. Hurrah! The food changes daily to fit in with what is local and seasonal….and boy does it pay dividends! We started with chickpea chips with a truffle mayonnaise….though chickpea fish fingers (sans fish) would be closer to the mark. Inventive, perfectly cooked and scrummy. I had lamb, a beautifully cooked thick slice served on a bed of perfect creamy mashed potato and a delicious mint sauce while she who must be obeyed, aka the dishy blond, had wild mushroom tagliatelle with serious proper chunks of cep (porcini). None of that namby pamby, “wave the expensive ingredients over the plate and add it to the description” here. Servings are satisfying! A superb dessert of salted chocolate and almond terrine with coffee ice cream and amaretto biscuits (they didn’t make it into the photo – they were eaten instantly) followed together with a divine damson whisky and coffee. What then of the booze? She who must be obeyed enjoyed a glass of Legato Inzolia 2017 from Sicily and a glass of Mas Puech Picpoul de Pinet 2017 (France), both very drinkable and much nicer than the standard white wine pub fare. Personally I had a light ale, Tangmere Tower….and for the lager lovers they serve Budvar (not to be confused with that American Budweiser rubbish). Dinner for two with shared starter and dessert, drinks and coffee was £74.90. Really good value for a memorable meal. We will be back! 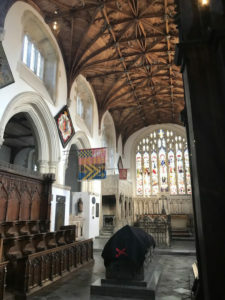 We went for a short drive to Arundel, a small very picturesque town, nestling on the river Arun and visited the cathedral (where I bought out their entire stock of “hug” cards) followed by a short look at the nearby St Nick’s. When I was a kid we used to visit both for midnight mass. A family friend was vicar at St Nick’s. He gave the world’s most boring sermons save for one memorable occasion when he described men as steady and reliable and ladies as emotional and erratic! We all used to meet for champagne in the morning…next day it wasn’t just the champagne that was chilly! I remember him backing into a corner, herded by a squad of furious ladies while he waved his hands trying to explain from behind the protective barrier of his wife. The sermon at the cathedral was far better, but standing at the back with the drunks was an aromatic experience! 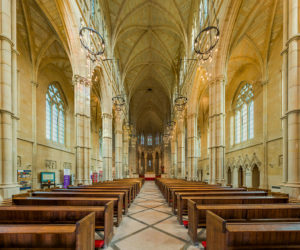 The cathedral – built in 1868 in the French 14th century style. It looks like it’s stone….it’s actually stone clad brick. The original Catholic church – St Nicholas’ was taken over during the reformation and is now protestant….or most of it. Go behind the altar and look through the glass wall into the Fitzalan chapel with it’s beautiful stonework and lovely wooden ceiling. The Fitzalan chapel is the private chapel of the Duke of Norfolk – the leader of the catholic church in England. During the English civil war Cromwell put cannon in the church tower and fired onto the castle. There has been a castle there since 1066 – though the original was more of a wooden palisade. Now it is a full on stone castle complete with a hidden room, furniture with hidden compartments and a tunnel towards the river. Ask the guides and they will show you the room and the compartments (the tunnel is unsafe). It looks very splendid! Also popped into the award winning Tea and Biscuit Club – they make their own blends with more varieties than you can shake a teaspoon at then a quick trip down memory lane. The shop where my Mum sold flowers and my father antiques. The house we used to live in which I thought was haunted and hated….and the house we lived in which was haunted and I loved. I never saw the ghost – he was called Mr Sandeman because he looked like the chap off the Sandeman port bottles and used to annoy our neighbours because he left their lights on. The neighbours had a big soppy alsation called Bruce – I have loved alsatians ever since. The museum that was full of dancing mice and stuffed animals, and the shop where I was caught swapping price tags to save 2p (floods of tears from that one). Arundel feels smaller than it did when I was a child; the castle smaller and my parent’s shop likewise…but there’s a lot to see and I really recommend it. The blog photo is me and my wife on the occasion of our wedding in Venice (October 2004). 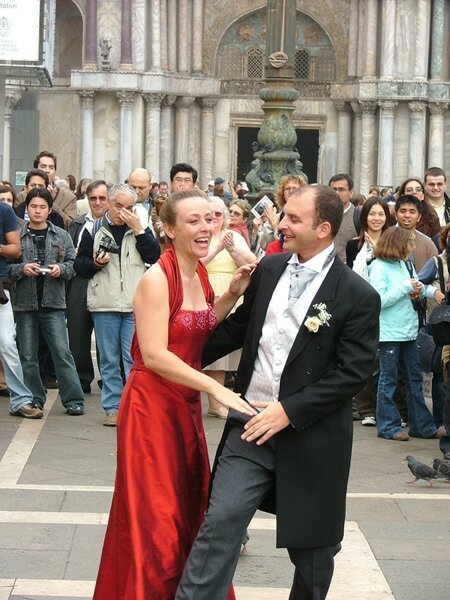 We danced in St Mark’s square together with our guests. We drew quite a crowd and had I gone round with a hat might have been able to pay for the wedding. A lovely special memory. May our life be full of special memories, and if you’d like some magical memories I know a man who can help ;-).